Alternatively, if the bond price and all but one of the characteristics are known, the last missing characteristic can be solved for. A bond may or may not come with attached coupons. A coupon is stated as a nominal percentage of the par value (principal amount) of the bond. Each coupon is redeemable per period for that percentage. For example, a 10% coupon on a $1000 par bond is redeemable each period. A bond may also come with no coupon. In this case, the bond is known as a zero-coupon bond. Zero-coupon bondsOriginal Issue DiscountAn original issue discount (OID) is a type of debt instrument. Often a bond, OID's are sold at a lower value than face value when issued, hence the D in OID. On maturity, the face value is paid out to the investor. The difference received is a gain to the investor, and is effectively the interest paid are typically priced lower than bonds with coupons. 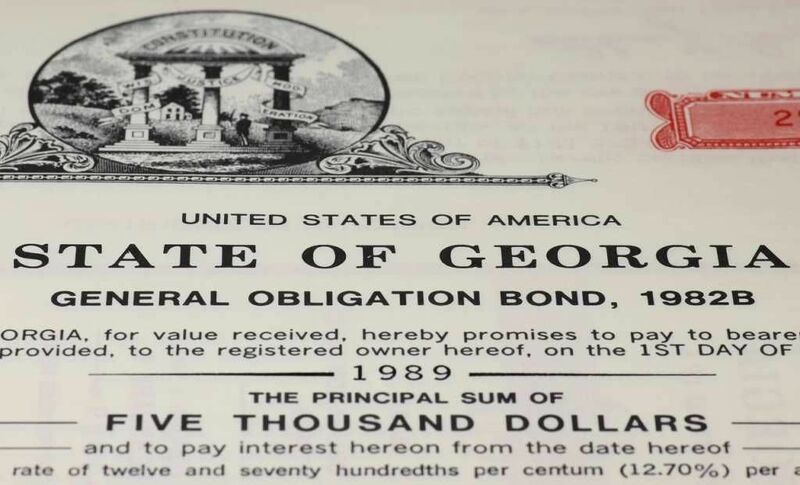 Each bond must come with a par valuePar ValuePar Value is the nominal or face value of a bond, or stock, or coupon as indicated on a bond or stock certificate. It is a static value determined at the time of issuance and unlike market value, it doesn’t fluctuate on a regular basis. that is repaid at maturity. Without the principal value, a bond would have no use. The principal value is to be repaid to the lender (the bond purchaser) by the borrower (the bond issuer). A zero-coupon bond pays no coupons but will guarantee the principal at maturity. Purchasers of zero coupon bonds earn interest by the bond being sold at a discount to its par value. A coupon-bearing bond pays coupons each period, and a coupon plus principal at maturity. The price of a bond comprises all these payments discounted at the yield to maturity. Bonds are priced to yield a certain return to investors. A bond that sells at a premium (where price is above par value) will have a yield to maturity that is lower than the coupon rate. Alternatively, the causality of the relationship between yield to maturityCost of DebtThe cost of debt is the return that a company provides to its debtholders and creditors. Cost of debt is used in WACC calculations for valuation analysis. Learn the formula and methods to calculate cost of debt for a company based on yield to maturity, tax rates, credit ratings, interest rates, coupons, and and price may be reversed. A bond could be sold at a higher price if the intended yield (market interest rate) is lower than the coupon rate. This is because the bondholder will receive coupon payments that are higher than the market interest rate, and will therefore pay a premium for the difference. Bonds will have a number of periods to maturity. These are typically annual periods, but may also be semi-annual or quarterly. The number of periods will equal the number of coupon payments. An easier way to remember this is that bonds will be priced higher for all characteristics, except for yield to maturity. A higher yield to maturity results in lower bond pricing. Bonds are rated based on the creditworthiness of the issuing firm. These ratings range from AAA to DS&P - Standard and Poor'sStandard and Poor's (S&P) is a market leader in the provision of benchmarks and investible indices, as well as credit ratings for companies and countries, and other financial information services.. Bonds rated higher than A are typically known as investment grade bonds, whereas anything lower are colloquially known as junk bonds. Junk bonds will require a higher yield to maturity to compensate for their higher credit risk. Because of this, junk bonds trade at a lower price than investment grade bonds. Bonds that are more widely traded will be more valuable than bonds that are sparsely traded. Intuitively, an investor will be wary of purchasing a bond that would be harder to sell afterwards. This drives prices of illiquid bonds down. Finally, time to the next coupon payment affects the “actual” price of a bond. This is a more complex bond pricing theory, known as ‘dirty’ pricing. Dirty pricing takes into account the interest that accrues between coupon payments. As the payments get closer, a bondholder has to wait less time before receiving his next payment. This drives prices steadily higher, before it drops again right after coupon payment. Fixed Income TradingFixed Income TradingFixed income trading involves investing in bonds or other debt security instruments. Fixed income securities have several unique attributes and factors that affect their price and value. Fixed income investing is favored by investors who prefer low-risk investments with a guaranteed return. Bond TermsFixed Income Bond TermsDefinitions for the most common bond and fixed income terms. Annuity, perpetuity, coupon rate, covariance, current yield, par value, yield to maturity. etc. The Corporate Finance Institute offers a complete education in finance and financial analysis. Advance your career in investment banking, private equity, FP&A, treasury, corporate development and other areas of corporate finance. Enroll in CFI’s Finance Courses to take your career to the next level! Learn step-by-step from professional Wall Street instructors today.